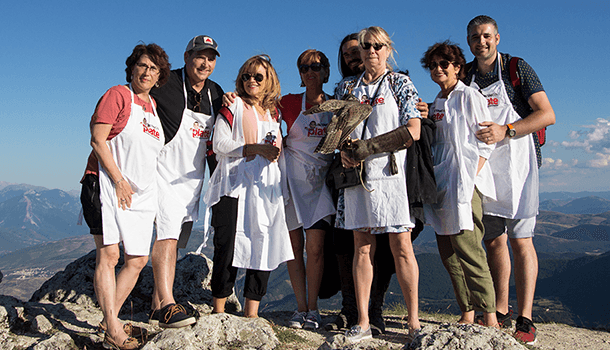 This exclusive Tuscan tour is reserved for just 10 lucky guests and there will only be one opportunity to be a part of it in 2018. Due to demand, the 8 day experience has been carefully designed to showcase a unique side to the world renowned region. 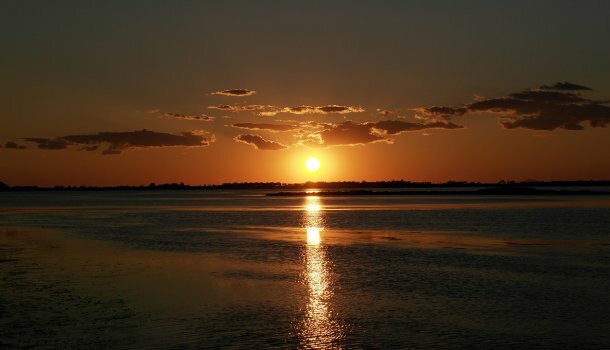 It has been scheduled for the late Summer season so that you can enjoy the most of your days – and sunsets! 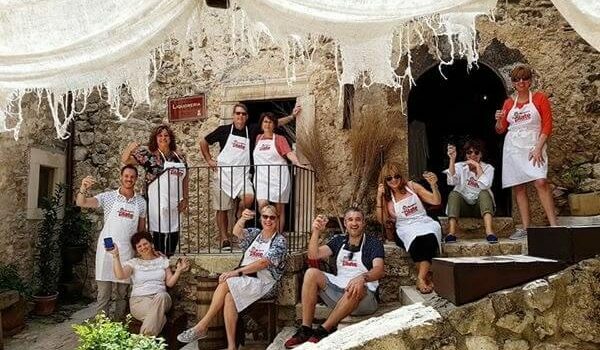 Simply click BOOK NOW below to join this once in a lifetime opportunity and explore Italy in great company. Dreaming about heading to Italy but dreading crowds and tourist food? Why not embark upon an intimate 100% authentic experience where you eat, drink and explore alongside the locals while seeing sights even wilder than your imagination? 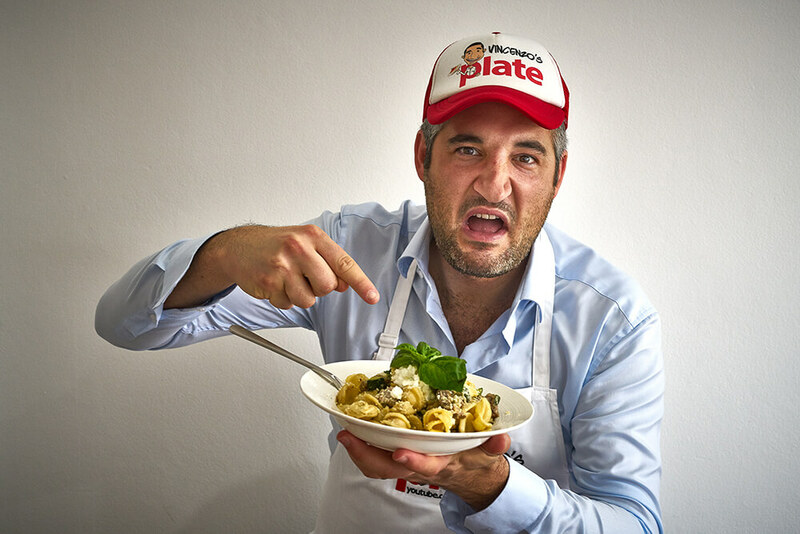 Prominent Italian food blogger and home cook Vincenzo’s Plate together with a renowned Italian Tour Operator have created the Italian tour of a lifetime in Tuscany. 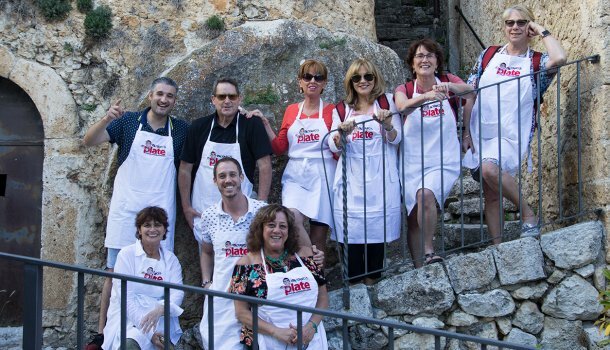 Join this tour to explore and uncover the most spectacular parts of this artistic region in Italy, where you will see and taste a whole new slice of the illustrious Italian gem, which boasts some of the best Italian cities and postcard-perfect landscapes. THE REAL ITALY AS YOU’VE NEVER SEEN IT BEFORE! Venture to a family-owned farm where fresh produce is aplenty to learn how they produce olive oil and wine – plus have a taste! Pick-up of the group in Florence at 9am. Departure by minibus to Vinci, the small town surrounded by rolling hills where the famous genius Leonardo da Vinci was born. Leonardo’s Hills, as all the Montalbano slopes, are famous for their olive trees and vineyards, which produce renowned extra virgin olive oils and wines. 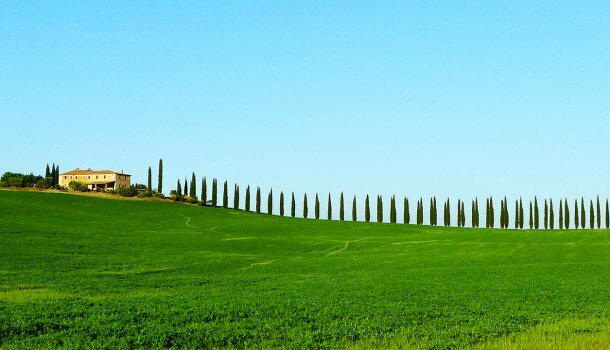 You will visit a farm deep in the beautiful landscape near Vinci, producing olive oil and wines and have a wine and oil tasting, accompanied by a light lunch based on delicious typical Tuscan products. 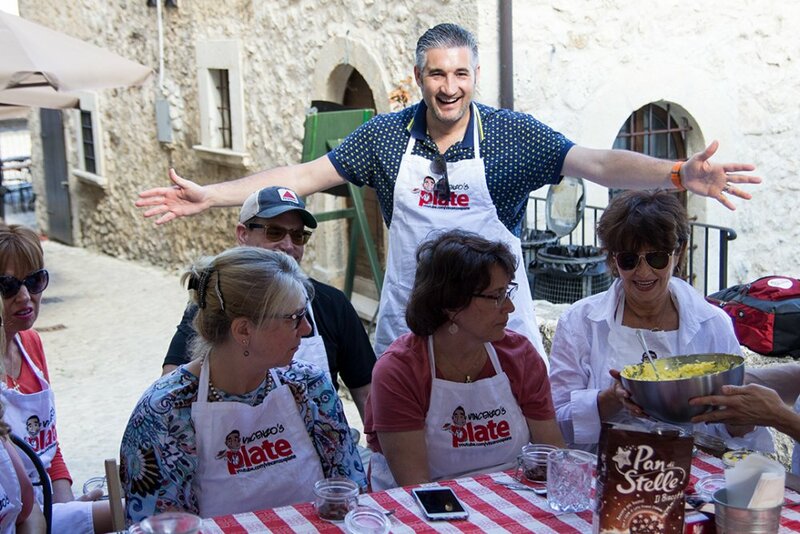 Then, depart to the country Relais, deep in the beautiful countryside of Tuscany and enjoy a 2-hour cooking lesson with Vincenzo followed by a welcome dinner served on a divine open terrace. 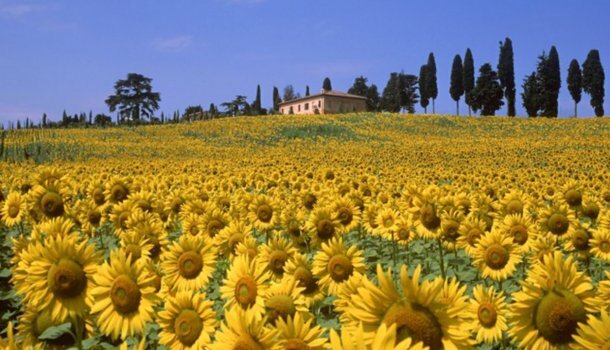 Enjoy a Tuscan breakfast, then depart for Lucca, a picturesque town surrounded by ancient walls that are still intact! 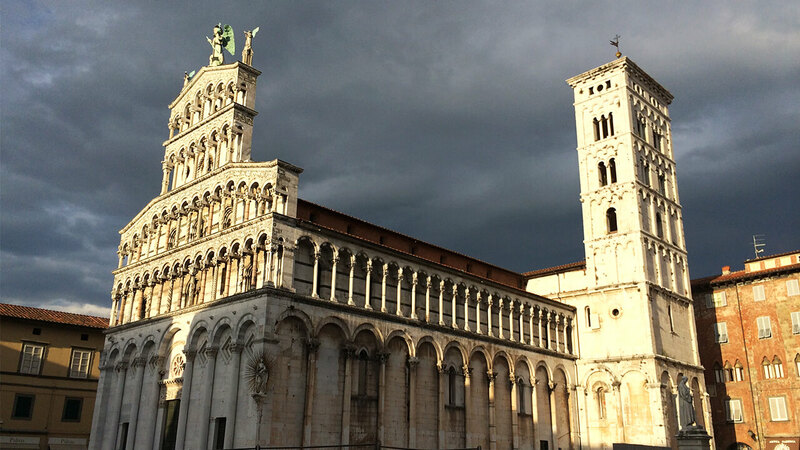 On this guided visit of Lucca, you will discover the main artistic treasures of this enchanting old town followed by lunch in an authentic Tuscan reastaurant in the heart of the city. After lunch, it’s time to visit the home to where the most marble is produced on earth, Carrara. Here you will have an engaging tour of the quarries by 4X4 off road vehicles. During this experience, you will also taste the famous Lardo di Colonnata which is a salumi that has been produced since the Roman ages. Your wonderful day will then be complete once you devour a divine “Aperitivo Cenato” which is a dinner-style aperitivo served on the panoramic terrace of a renowned place of the Valdinievole area. 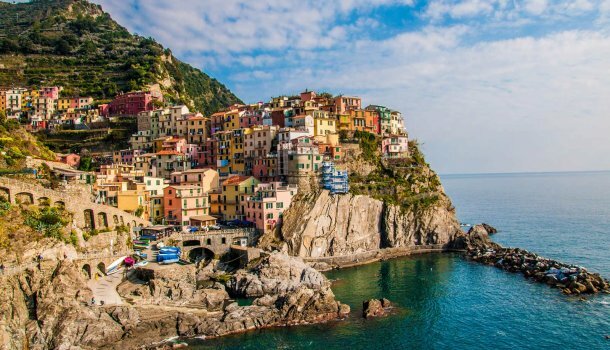 Embark upon a full-day private boat tour discovering the heavenly Cinque Terre, one of the most amazing and enchanting landscapes in the world: five (Cinque) villages, hanging between sea and land, listed by UNESCO as a World Heritage site. 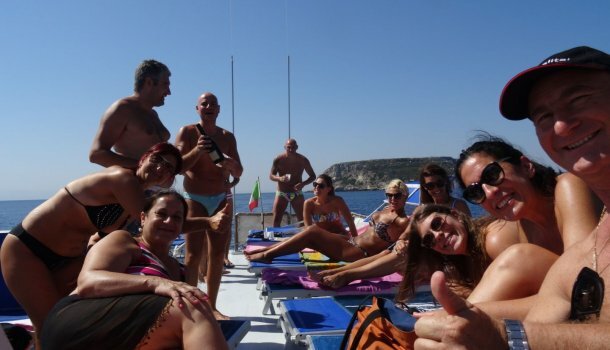 You’ll lick your fingers with delight as you are spoiled with lunch aboard, tasting typical Ligurian food and wine not to mention a wonderful view of Vernazza, one of the 5 villages, from the sea. Return and dinner at the Relais. It’s time to visit Pistoia, a gorgeous medieval town of quiet charm, still livable and away from the hustle and bustle of too many tourists. This spot has been declared Italian Capital of Culture in 2017! After a guided tour, lunch will be served in a typical “trattoria”. 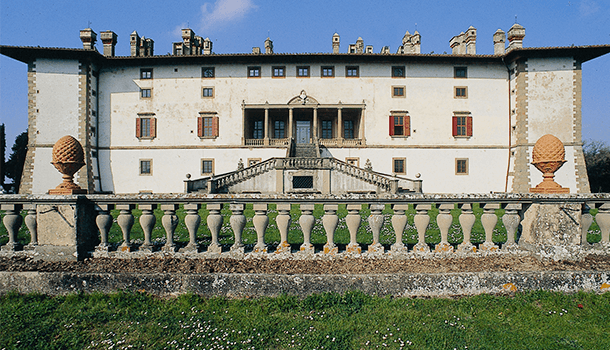 Then, in the early afternoon it’s time to visit the famous Medici Villa of Artimino, situated deep in the enchanting countryside between Pistoia and Prato. 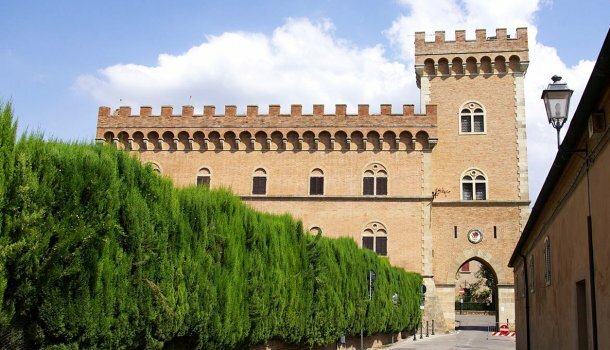 This Tuscan Villa is one of the majestic country residences built by the members of the powerful Medici family. The highlights of the day don’t end here! It’s then time for the Discovering Carmignano DOCG experience: a tasting of 3 typical wines of the area, served in a room in the villa – and yes it will feel like a you’re living in an ancient fairytale. Then, in the garden, your eyes will be amazed by a thrilling falconry show before enjoying an Aperitivo cenato in the restaurant which is an ancient residence. 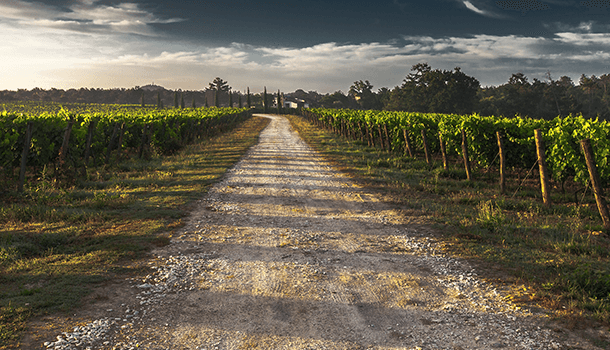 A morning departure follows breakfast for a tour of the Chianti area, famous all over the world for its rolling hills and picture-postcard landscapes. You will visit a renowned wine cellar in the area for wine tasting, accompanied by typical Tuscan culinary goodies. Lunch will be served in a fantastic restaurant situated deep in the wonderful landscape. 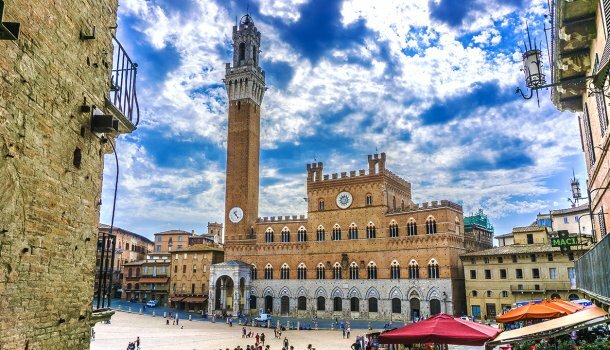 After lunch, we venture to Siena for a pleasant 1-hour guided walking tour of the city, one of the most popular cities of Tuscany, whose old center was declared a World Heritage Site by UNESCO. After Siena we transfer by minibus to a beautiful farm in the heart of Maremma an area of timeless rural landscapes and this will be our accommodation for the next 3 nights. Welcome light dinner at the farm…along with matching wines of course! 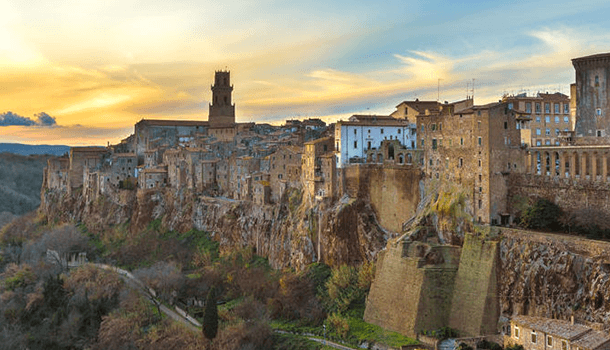 Visit of Pitigliano, a village known as “The Little Jerusalem” because of the historical presence of an important Jewish community. 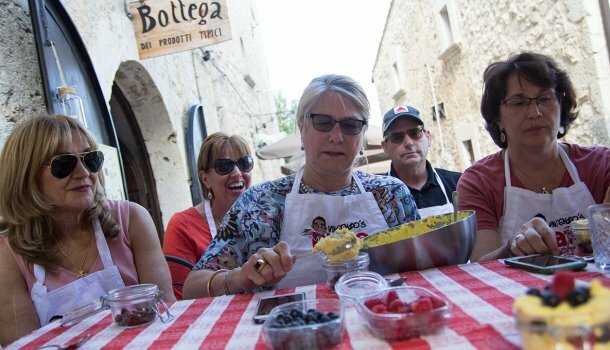 Here you will have the chance to roam free and select one of the several wineries, restaurants and “osterias” of Pitigliano to enjoy your own private lunch. 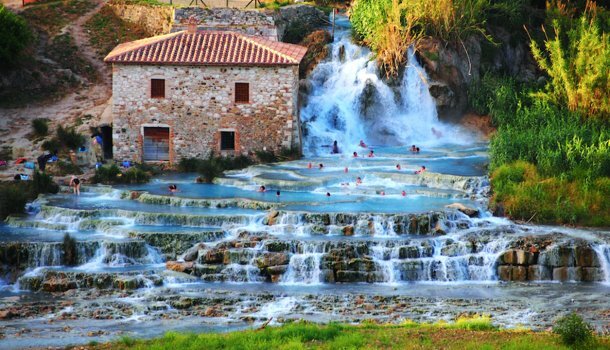 In the early afternoon, we depart for the famous Terme di Saturnia, one of the most ancient and famous thermal spas of Tuscany. Here, you have the chance to enjoy a dip in the thermal swimming pools at the resort, an area with four hotspring pools, waterfalls, jacuzzis and water courses of warm and cold water. Here you can simply soak and enjoy the warmth of the sulphurous steam or be stimulated by a thousand bubbles in a hydromassage. Cradled by the water, naturally heated to 37°C and by the sound of the waterfalls, your body will certainly feel light and its skin smoothened as it is caressed by the steam. Dinner at the farm.. Between the provinces of Grosseto and Pisa is the Biancane Natural Park, and located inside is the captivating Devil’s Valley. The entire area is characterized by volcanic and geothermal features, like geysers, hot springs, mud pots and fumaroles, which have made the landscape fascinating! In this area, you will also visit an old cheese factory and discover the ancient art of producing cheese – not to mention tasting some of these cheeses produced by sheep’s milk too. 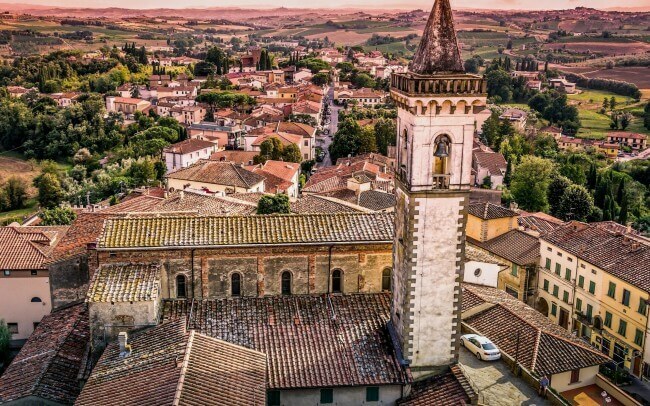 Lunch is then served in a brewery of the area that produces beers using the underground vapors..
After lunch, it’s time to head to Bolgheri, a village where the famous Italian poet Giosuè Carducci lived and composed some of his famous poems. It’s also famous for its fine wines, and after the tour of the village, you will visit a renowned wine cellar for some more “wine education”, ie: tasting (!) accompanied by a light dinner. Your final day is no-less spectacular than any other. After breakfast and check-out we journey up to Orbetello, famous for its historical WWF Oasis, where the most important lagoon of the Tyrrhenian Sea is located. Here, you will taka a final private boat tour on the Lagoon of Orbetello, and admire some of the hundreds of species of birds which are native to the area. Of course, no journey like this is without delicious food, and you will be served an aperitivo aboard: this time with a glass of Prosecco. Lunch then be at a beautiful farm near Orbetello, where a live band will entertain you with typical Tuscan music and songs – all just for you. Drop – off service to Rome where you will arrive around 7.00 pm.